There are a handful of good inbound marketing providers in the market today (and a lot of bad ones). In a lot of ways this creates healthy competition and allows for a diverse range of options for technology companies. Choosing between a large corporate inbound provider (like iMPACT) and boutique one (like Responsify) can be challenging. 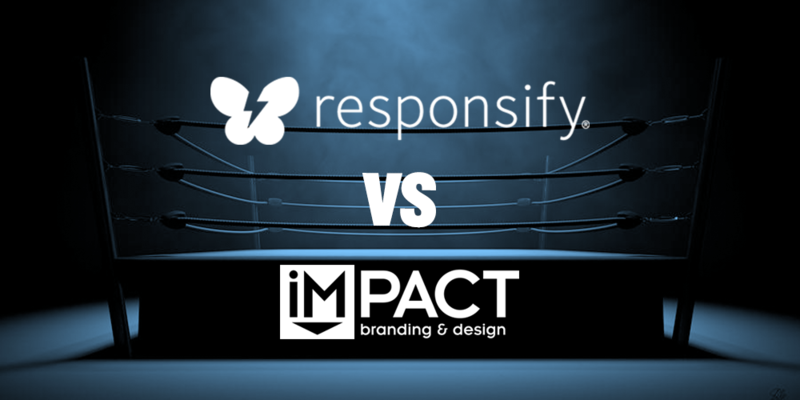 In this article we will outline as honestly as we can the pros and cons of Responsify vs iMPACT to help companies decide which option is best for them. iMPACT is a large inbound marketing provider located in Wallingford, Connecticut. iMPACT is a company that helps a wide variety of companies across a wide variety of industries. They have a large staff to service their very large base of clients, with no specific niche, as they like to help anyone who can afford their services. Responsify specializes in inbound marketing, are certified Hubspot partners, and are located in Brooklyn, New York at the center of creativity. Responsify’s mission is to empower people to experience a better quality of life. This drives Responsify to specifically focus on helping education, health, and clean energy technology companies accelerate their growth and make a greater impact. • Does not compete by sacrificing content strategy and quality to offer “cheapest” service. One industry secret to think about… Google is constantly updating their algorithm for ranking and displaying results, to reward websites based on not only the “quantity” but more importantly the “quality” and “relevance” of their content. When it comes to B2B lead-generation where highly valuable leads are on the line, you can’t afford to make a bad impression with them with sub-par content. In short, there’s nothing more important then getting the “right qualified traffic” to your website. Working with a boutique partner, specializing in your industry, will allow you to convert the right decision makers and influencers to valuable leads, shortening your sales cycles and increasing sales velocity. There are a lot of things to consider when choosing to go with either a jack-of-all-trades corporate inbound agency, or a specialized boutique one like Responsify. Choosing the right one will effect the quality of traffic you draw and the results you will get 6-12 months down the line. Think about which inbound provider will truly be there for you along the way, as a true partner to help you grow. Whether you choose a cheap solution that comes with drawbacks, or the reasonable one that comes with critical benefits, make sure you are willing to accept the result of your decision. Your decision will ultimately have a long-term effect. If you want to learn what budget you should create for inbound marketing, check out this article: Setting the Right Budget for Your B2B Inbound Marketing Campaign. If you are in one of the industries we proudly work with including EdTech, HealthTech, and CleanTech, and you’d like to discuss how we could potentially help you grow, let’s chat! You can book a time to have a call here.